Beautiful Cabin. What an awesome view of Gods Creation. Beautiful cabin We loved the view and the birds chirping. We enjoyed a very relaxing week. An apt description would be "the other side of paradise". Besides being stocked with every conceivable convenience, the views change so subtly by the minute. It is so difficult to leave - should you do so -don't miss the Museum of the Cherokee. To all future guests, enjoy your stay. I spent 4 days at Whispering Wood Cabin last week with some friends from high school. We hadnt seen each other in many years and it was an absolutely amazing weekend! The area is beautiful and the cabin was so warm and inviting, we loved it! I especially loved the deck with the hot tub and porch swings. It even had Wi-Fi. We enjoyed a fire in the fire pit one night (sorry for the noise down-the-hill neighbor!). The kitchen had everything we could have asked for, including instant hot water. The rooms are spacious and lovely. The birds chirped. Even the almost constant rain couldnt dampen our time there. I recommend this cabin to anyone wanting a great get-a-way. I know I cant wait to go back again! What a beautiful place. Thank you for sharing your part time home. Christin of Winston Salem, NC: What a wonderful getaway! We loved every moment! Thank you for allowing us to enjoy your cabin. As soon as we got there we felt welcome. We had a special visitor by the of Jake. I believe he was one of the neighbors dogs. He made himself at home on the porch for awhile then that was the last we saw of him. We loved the bear dcor in the cabin. The cabin was very cozy & relaxing. We really appreciated the well stocked kitchen, since we cooked breakfast & dinner here. We had a great time. Sad to say we have to leave today but we enjoyed the cabin tremendously. I am sure we will be back to visit again in the near future. The view is spectacular. My gift back to the owner is a blessing from God that this property will always be everything you intended. God bless you and all who stay here! My husband and I came to the cabin for some much needed time away. What we found was that and more! The cabin is so lovely that it felt as if we were on a honeymoon. We went to the Smoky Mtn. Ntional Park, Gatlinburg, whitewater rafting and even hiking but nothing compares to waking up every morning and seeing the mountains from the bed. Thank you for allowing us to experience Above the Trees. We will never forget it. What an amazing view! We enjoyed our stay. We had a wonderful time here and most definitely plan on returning. We had a lovely relaxing time in this mountain paradise. With all the conforts of home and then some we were very pleased. It was our mother's first stay in a mountain cabin. She really enjoyed it. Waynesville is a quaint and safe place to walk and enjoy the local fare and artists. We saw a Blue Bunting in the driveway among a variety of other local birds. We would definitely come back to Millstone. Thank you for the great hospitality. Thank you so much for letting us stay here in your beautiful home we had a great time and look forward to coming back. Your cabin is beautiful and had the things we needed that we could not bring from home! 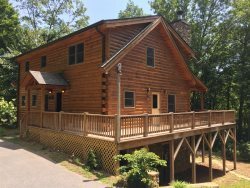 We enjoyed our stay and will recommend your cabin to our friends in the hills of North Carolina. Love the placing of the house for the view of the Smokys. We enjoyed. Thank you for "truth in advertising". This place is even better than promised, truly! The furniture, amenities and locale are just as pictured; all worked and the Hot Tub is an indescribable. It's so peaceful here, built for stress relief which we needed more than you will every know. We can't thank you enough for sharing this wonderful home with us. You have our gratitude and our endorsement. My mom and I did not want to leave and we will definitely be back.